Tonight I'm feeling a lot better and have a bit of energy for a change! 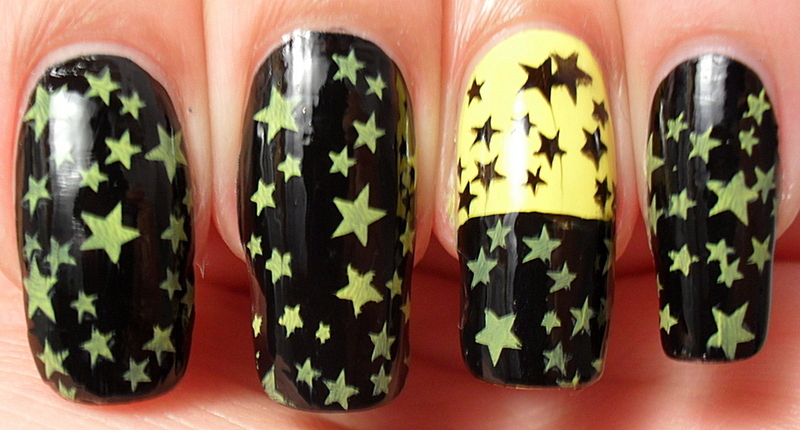 The challenge for today was to create a manicure inspired by the supernatural. 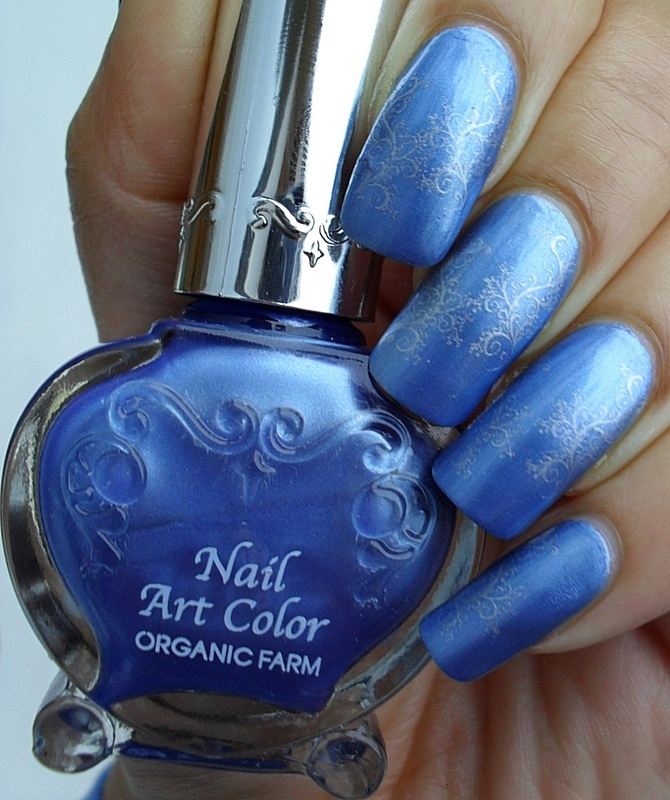 I decided to hunt down my matte top coat specifically because I haven't used it for so long. 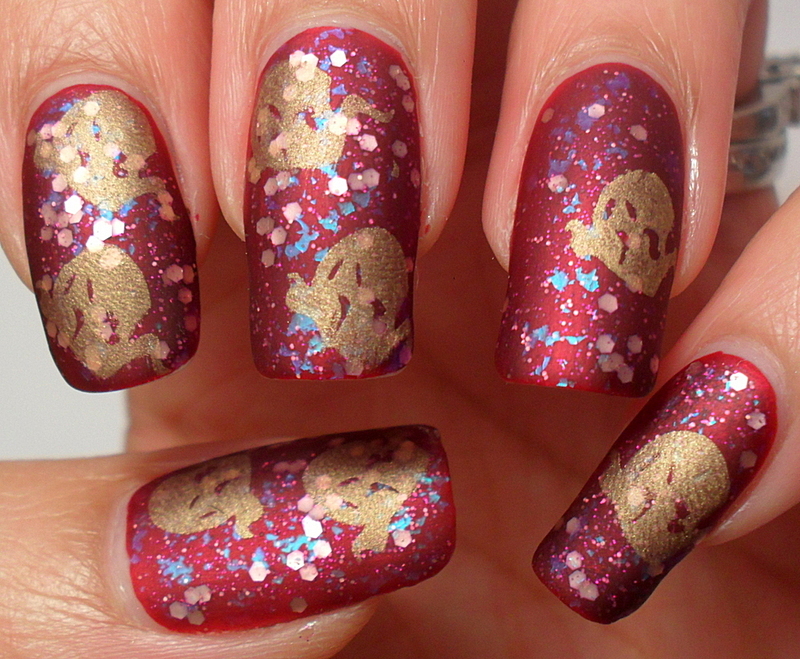 The red was layered with a pink hexagonal glitter (by Peripera), then layered with Nfu-Oh 50, stamped with Models Own 'Gold Digger' (using BM 223), then mattified with Rimmel Pro Matte Finish. It's not awful...could be worse! Hi friends (old and new). 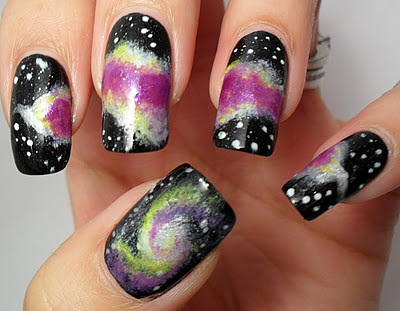 I'm afraid I'm not going to be posting an original manicure tonight. Okay, so it's my very own creation, but it's one I did a while ago. I simply don't have the energy to do what I would have liked to...I'm not feeling too well. 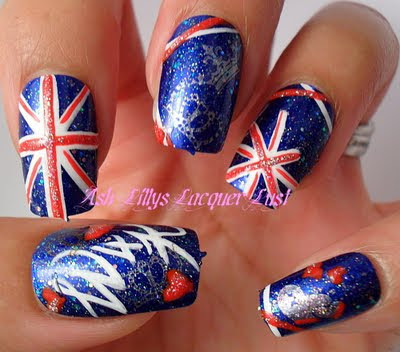 This is something I did to mark the wedding of Prince William and Kate Middleton. Have a look here for further details. 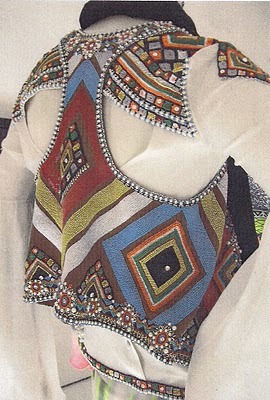 Today's inspiration is supposed to be taken from 'art work'. 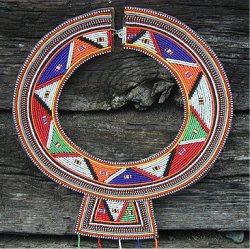 I chose not to go for an artist who dabbles in paints and canvas - instead, I took inspiration from a friend and the works of art that she regularly creates. 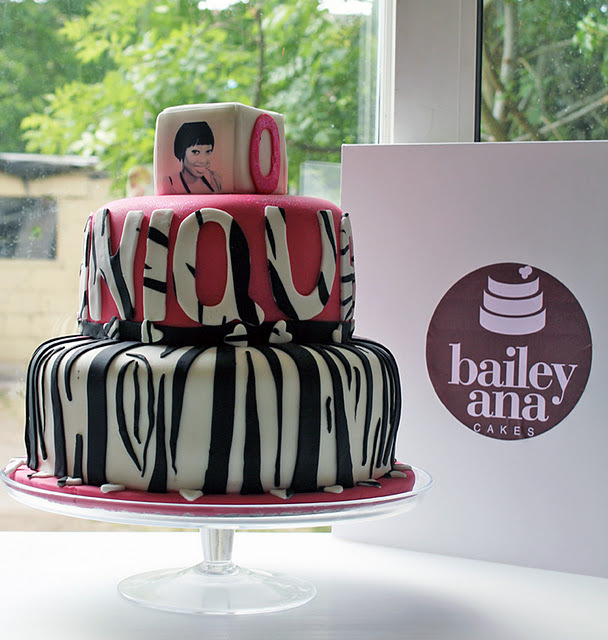 If you like sweet treats, you might want to visit Dewbien of Bailey Ana Cakes. 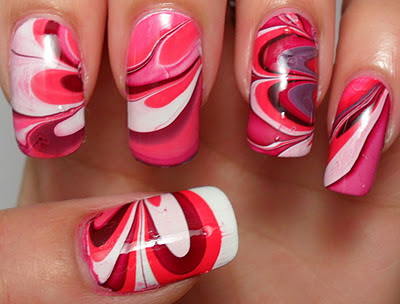 Gorgeous right? All I can say is that the birthday girl must have been very, very happy when she saw this! Good evening ladies (and gents). 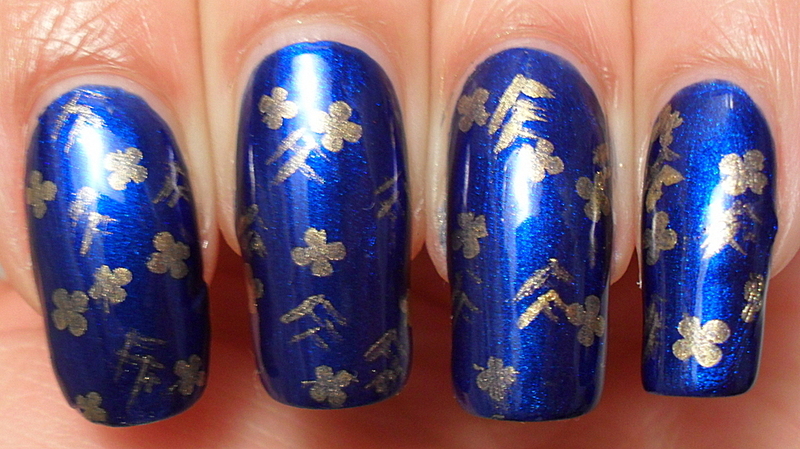 Tonight's manicure is based on a pattern that can be found on a Folli Follie bracelet. This is a Beauty UK mini - it doesn't have a name or number. Here is my inspiration. 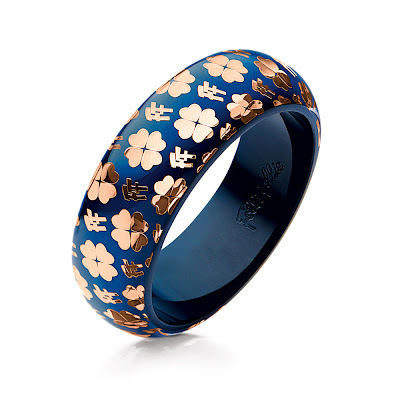 It's £73...but whilst the main body is resin, the motif is rose gold plated. 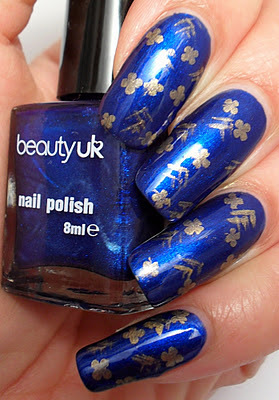 I wouldn't turn it down if it was bought for me, but I'd rather by polish! The plate used was BM03. A quick reminder for you. 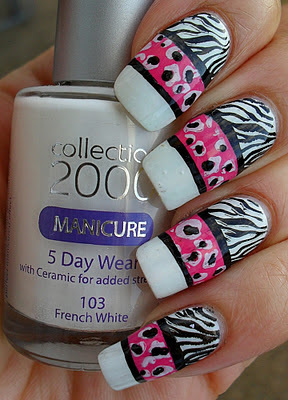 If you haven't entered my giveaway, you have four days left!! Yes, Yellow Peril makes another appearance as a base colour and also a stamping colour too. 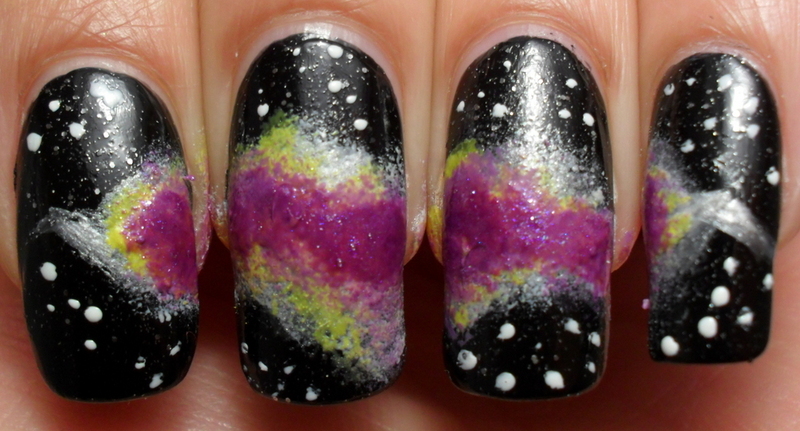 Excuse the smudging - I was a little too hasty methinks. Would you wear this print (as an outfit, not a manicure)? Viva La Nails Black Friday Sale - 25% off EVERYTHING! I have to share some news with you. 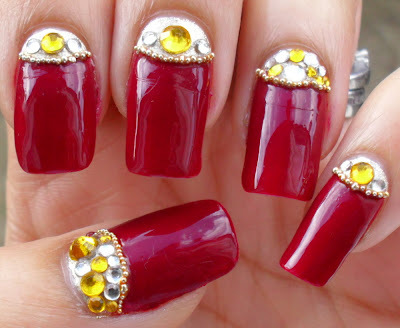 Viva La Nails is running a Black Friday sale! Now, we don't observe Black Friday here in the UK, but as it is the day after Thanksgiving in the US and is traditionally the start of the Christmas shopping period, this is the time when there are some crazy discounts going around. 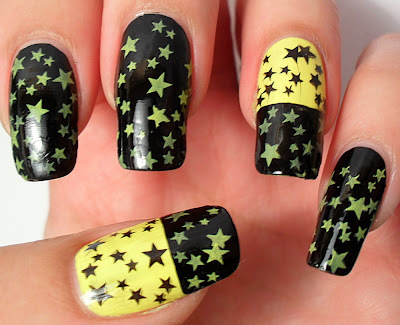 Viva La Nails is offering a 25% discount on ALL products on the website for three days; Friday until Sunday!! 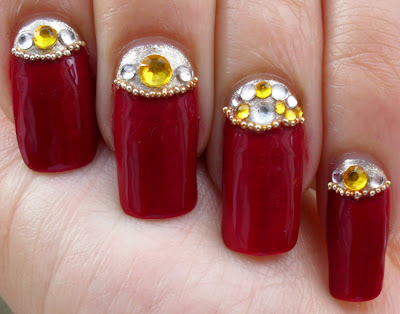 Now, if you are a regular reader, you will know that I have made several purchases from Viva La Nails over the past year and I've been very happy with them. 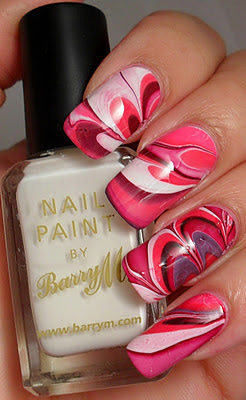 Their products are extensive and very reasonable in price (they have water decals from 95p on sale! ), so if you add a 25% discount...you do the math. Simply use the coupon code: BLACK at the checkout and you'll get your discount. Simples. I intend to take advantage of this offer...I've earmarked a few things I want. Let me know if you make a purchase, I'd be interested to see what you bought. 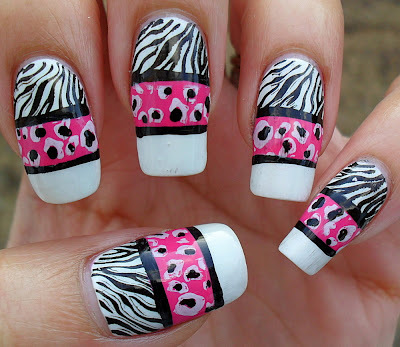 Whilst you're there, check out the nail art tutorials on the site. Hopefully they'll put up some Christmas designs soon. I nearly wasn't going to post anything tonight because I was busy gossiping with my cousin until quite late. 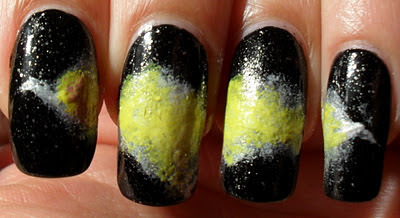 Today/tonight is a manicure inspired by a book. I don't often get to read for pleasure, but when I do, I'm afraid I'm a sucker for a Stephen King novel. I have quite a few of his books, but this one seemed like the easiest to capture in a manicure that could be 'worn'. Here we have 'Firestarter' a story about a father and daughter who are on the run from a government agency due to them possessing terrifying psychic powers. The father has the power of suggestion, which has dire consequences upon himself and others. The girl? She has pyrokinetic abilities and can start fires with her mind...great stuff. 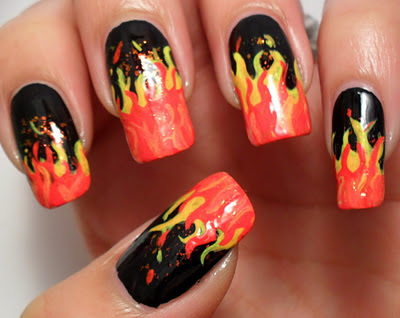 Black nail polish, yellow, orange and red acrylic paint with a layer of Nubar's '2010' on too to give the flames a shimmer. I thought I'd better bring some game, considering yesterday's manicure was pretty sedate. Day 23 of the challenge is inspired by a movie. Sorry, but it's a boring one today. I've had a few serious items on the work agenda this week, so I've been trying to keep the manicures a little sedate (so no flashy stuff I'm afraid). Today's manicure is inspired by that movie starring Prince, 'Purple Rain'. 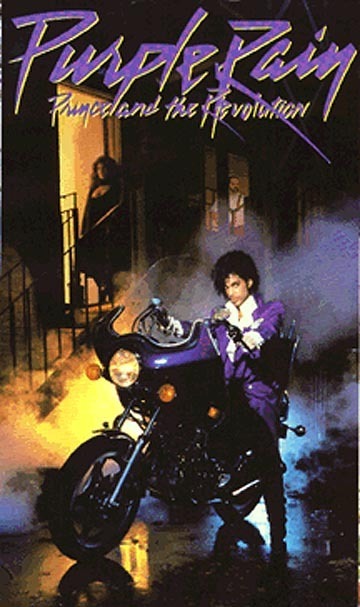 Ahh, Prince. I don't care what anyone says, he is the only man that can wear heels, make-up and a mullet and still have street cred. 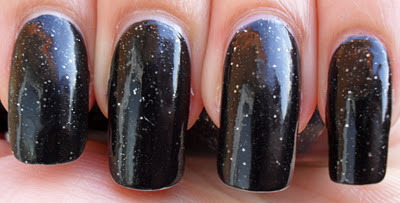 This is 'Urban-Night' from China Glaze's Metro collection. 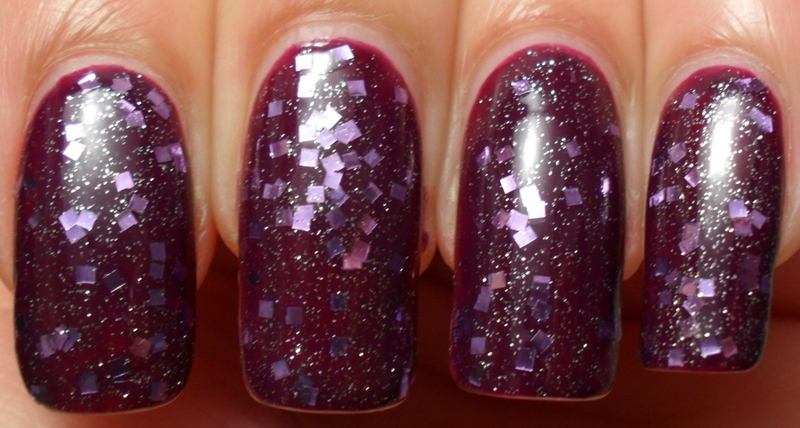 I got four minis in this set and I love this deep plum colour. 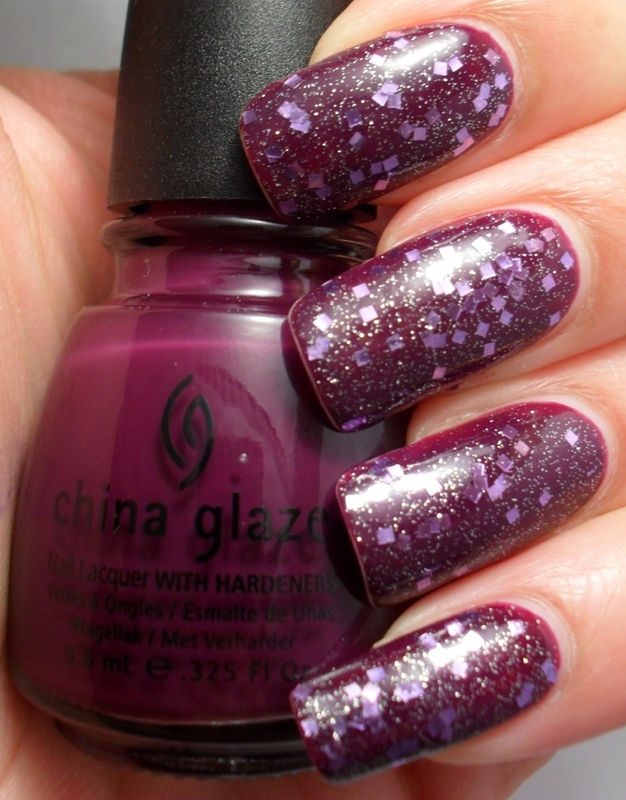 The topper is a purple hexagonal glitter and silver mini glitter combination mixed with a clear polish. It's name is 'Lavender' and it is by Barry M.
It's purple and if you think about it, it could pass as 'rain', right? 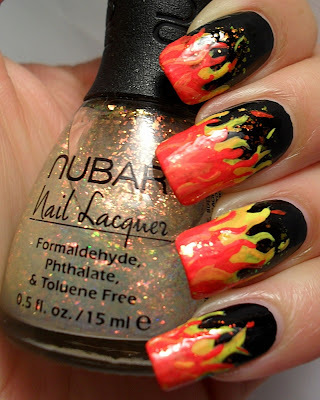 Sometimes I want to go to work without having a load of craziness plastered all over my fingers, so this just had to do - lol! 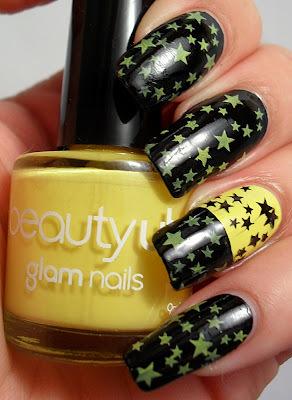 Tonight's challenge installment is inspired by a song...Follow the Yellow Brick Road from The Wizard of Oz. I know. Of all the songs in the world, why that one? Because my husband chose it and the fact that he's interested in the challenge really makes me smile. 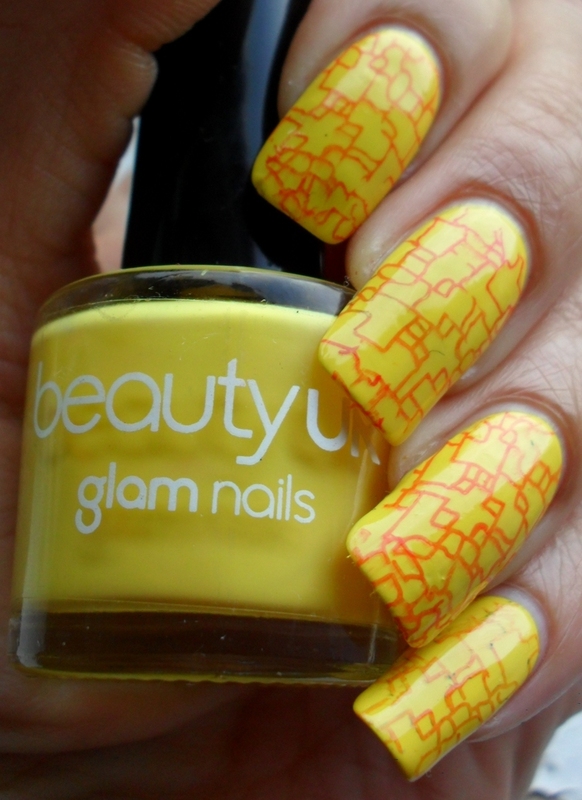 Beauty UK's 'Yellow Peril' with stamping from the S5 plate. I was trying to find a plate with a brickwork image on it but I didn't have one...but I bet 'The Kween of Konad', Sarahlouise has a few in her stash though! I had to settle for something that looked like dry, cracked earth. 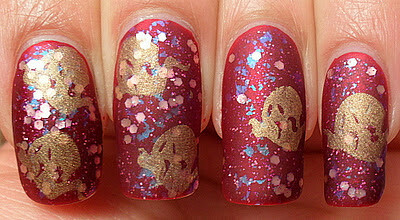 Stamping was uber sloppy for a number of reasons...carelessness being the main one. You guys, I'm fading fast... I'm running out of steam. I've got so many projects on the go - making jewellery and doing other crafty things and there aren't enough hours in the day. Work is also pretty stressful too right now soooo...I'm under pressure :) Hence the short post and solitary photo today. 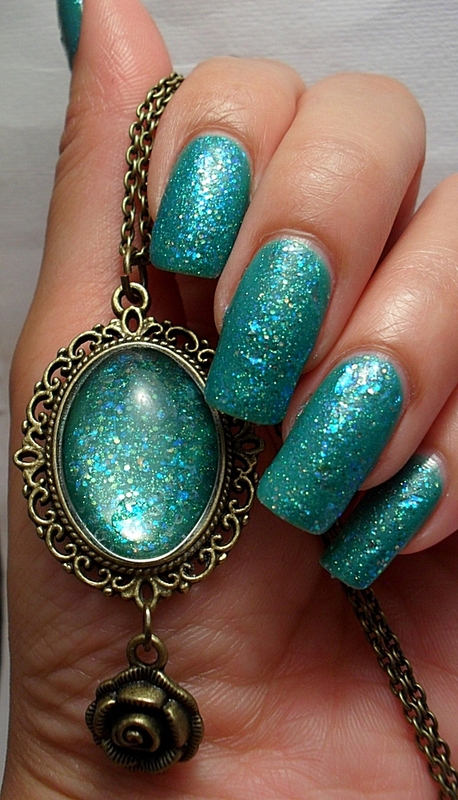 Today is supposed to be nails inspired by a colour. I've been inspired by a pendant I made some months back. 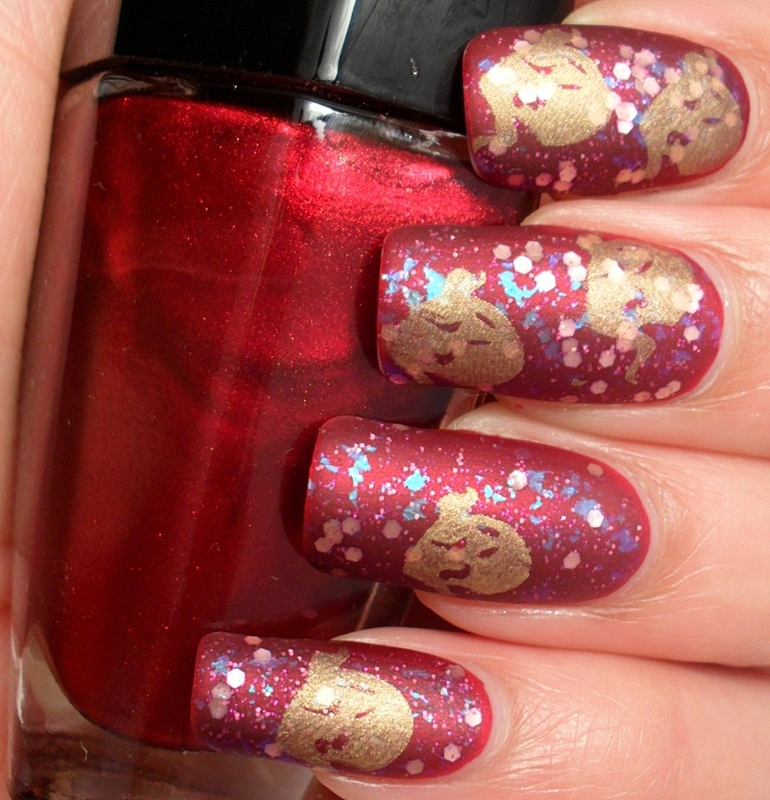 China Glaze's 'Mint Apple' and some random glitters. A little while ago when I wasn't blogging as much, I was making these nail polish pendants and of course, once one thing takes up your attention, other things (like blogging) fall by the wayside. You can see another pendant I created here. Maybe when I have some time, I'll post some more of the other colours and designs I've made, but for now, that's it! There are 10 days left in the challenge and 9 days left to enter my blog anniversary giveaway! Take care and I'll chat with you tomorrow. Gahhh, I tried my best to post whilst it was still Sunday, but I'm nearly an hour late. Never mind! 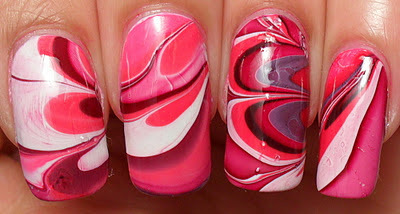 Here is my take on water marbling. I had some difficulty with some of the polish not spreading properly, but overall, it was less stressful than the last time I did it. 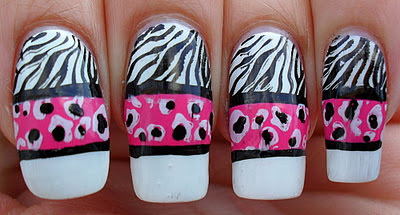 I was able to do this on the first go - with no mistakes!! Barry M's 'Matte White' (again), Nails Inc 'Claridges Street (bright red) and Nails Inc 'Victoria' (dark red). I did two fingers at a time. You can see that by the placement of the swirls. I think my favourite nail is the thumb. 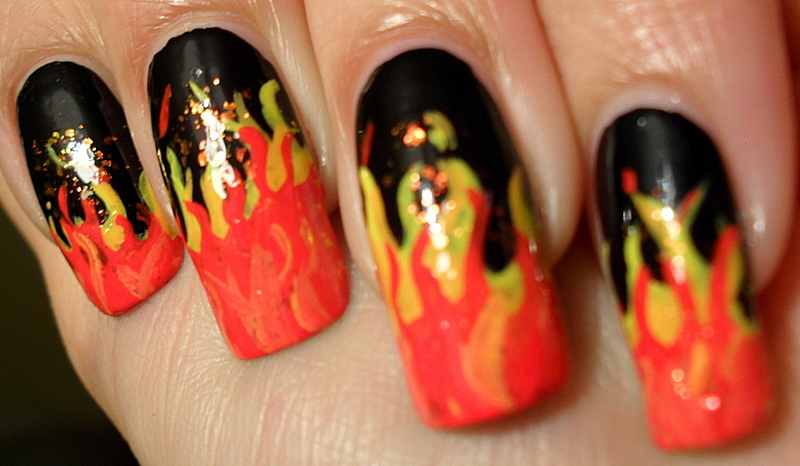 Overall, it's not perfect and I've seen better, but I like it nonetheless. I'm sorry - I don't know what a space time continuum is, or how it could shift, but I sure do like that phrase (I'm a trekkie deep, deep down). This was my first ever attempt at 'galaxy nails' and I actually enjoyed it. 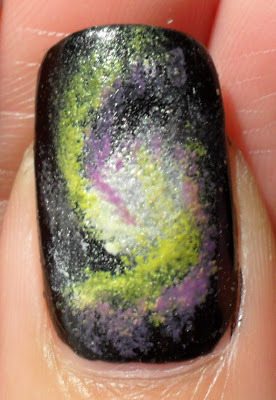 I'm not quite sure if it is as intricate as some I've already seen, but I think it resembles something galactic! Keep scrolling to see the outcome. 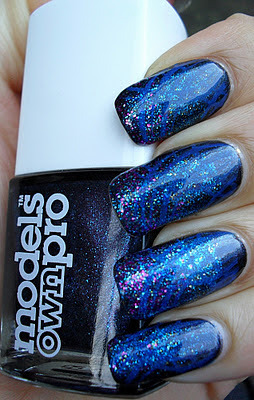 This is Orly's 'Goth'. 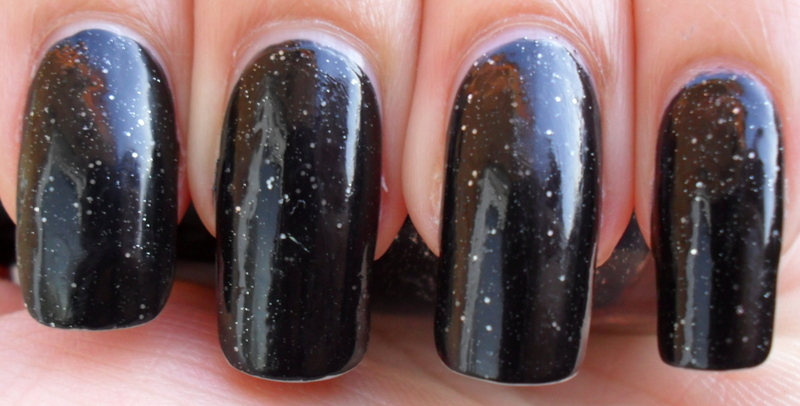 A pretty jet black lacquer full of silver glitter particles. Tip wear after applying it last night and washing, drying and styling hair this morning. This is how it started. Below is the end result and what I used and did to achieve it. 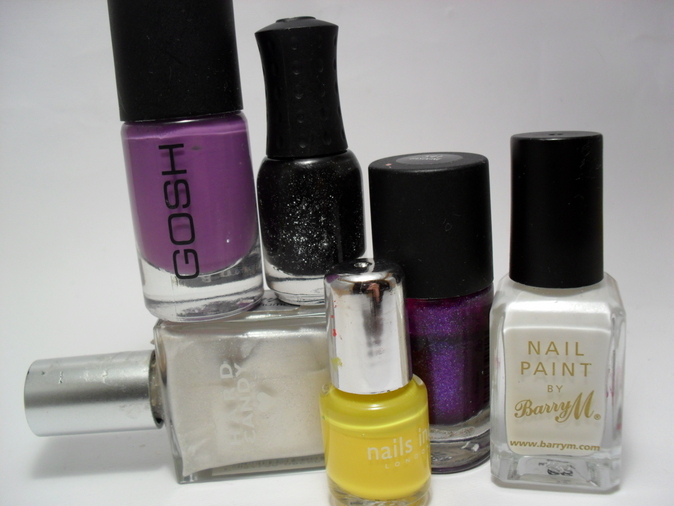 Hard Candy 'Skimpy', Gosh 'Wild Lilac', Orly 'Goth', Gosh 'Gasoline, Barry M 'Matte White' and Nails Inc 'Carnaby Street'. 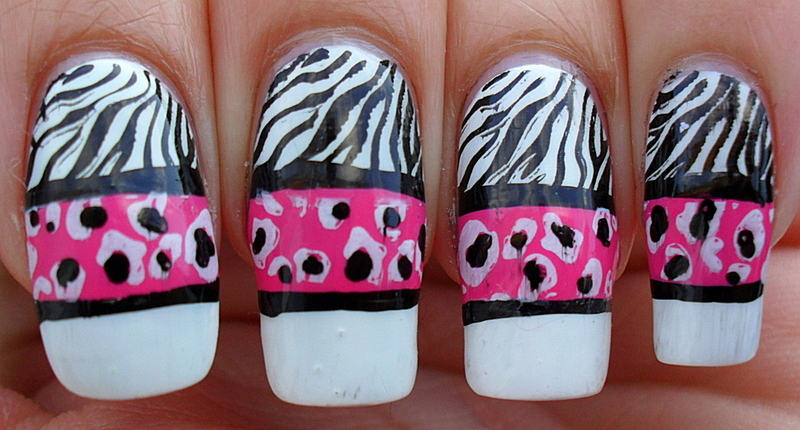 First, I painted on a zig-zag with the Skimpy (you probably don't need to do this. I was thinking of something completely different at the time). I sponged on some Matte White over the Skimpy and then some Carnaby Street, using an eye shadow sponge applicator.This allowed me to apply the polish more neatly. Then the Wild Lilac and the Gasoline. I added random dots of Matte White. I hope you enjoy looking as much as I did sponging. Good night folks. Oh gosh! 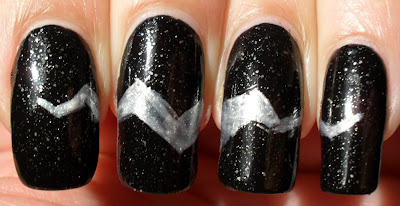 An hour left for me to show you my 18th manicure of the 31 day challenge...half moons. Now, I actually like half moon manicures and I really don't know why I haven't done them more often. Here are the photos... a LOT better than yesterday's! 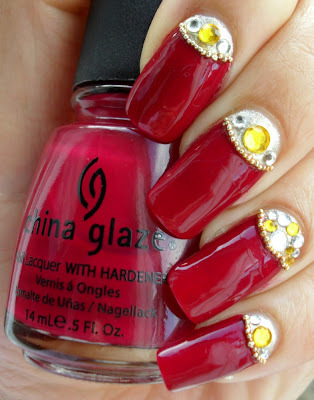 China Glaze's 'Seduce Me' and rhinestones from Viva la nails and the golden steel balls? I can't remember where they're from. As these were only going to be worn for one day, I didn't use glue - I stuck the rhinestones onto a layer of tacky clear polish and I didn't use a top coat on them either. Today is glitter day and I have some abismal photos to show you. It was so dark this morning that I couldn't take any pictures before I left for work. I chucked a bottle of polish and my camera into my handbag and decided to take the pictures on my lunch break. Oh dear. I was sculking around the back door, squinting, changing light settings and posing the polish bottle so as not to cover the label with my fingernails, whilst at the same time I was trying to act natural just in case someone caught me acting like a weirdo. With all the jumping and rushing, every photo I took was pants...apart from two. 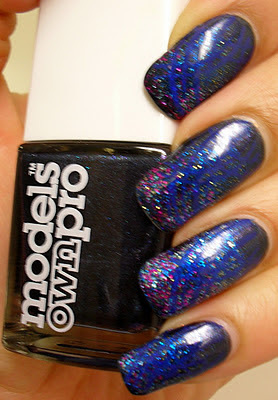 I started with Models Own Pro in 'Midnight Blue' bought in Boots at Brent Cross. The picture does the colour no justice and I will get around to swatching it properly at some point. 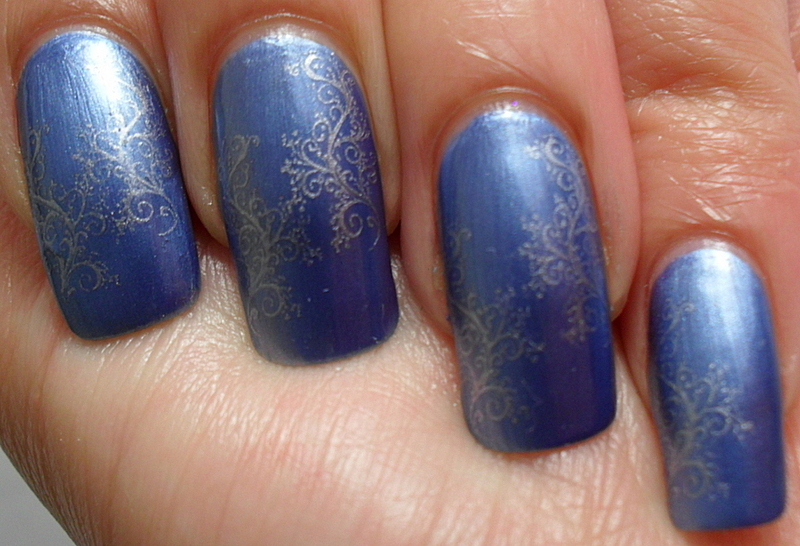 I then layered a gradient of OPI's 'Absolutely Alice' and Sinful Colors 'Frenzy'. 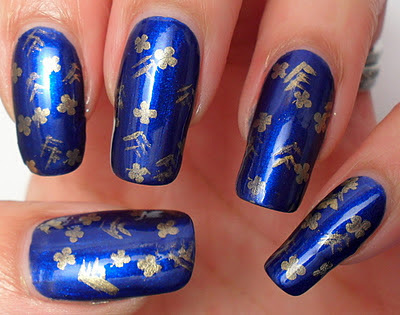 When I had finished, it was so bright, I would have caused a distraction in a very, very serious meeting I had at work, so I tried to dampen the bling (oh, how I hate that word) with some stamping. I used a blue Konad special polish and BM plate 201. 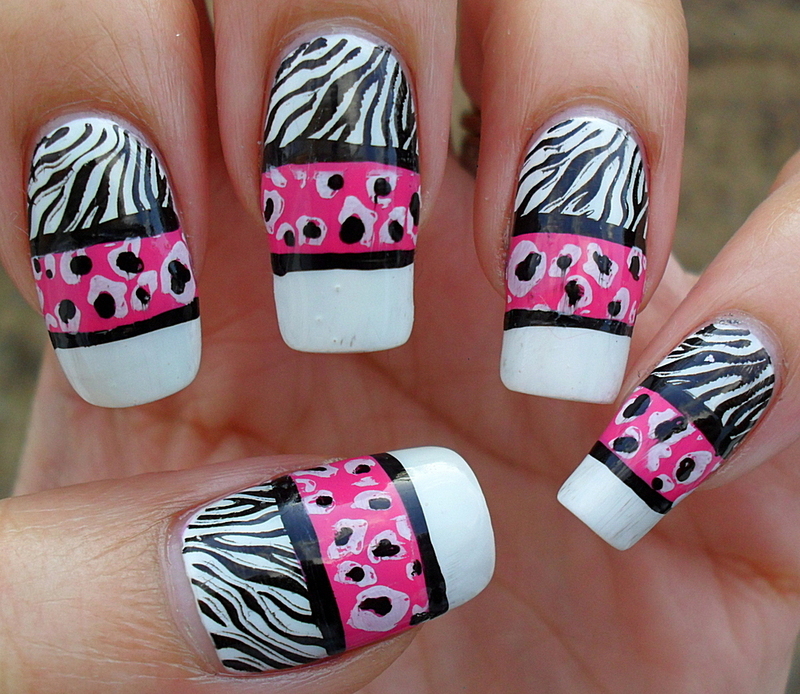 I'm not so fond of this one, but I was rushing and didn't have time to do it the way I would have liked. Well hi! How's it going? What's new? Today was tribal print day in the challenge and I was under some serious pressure. 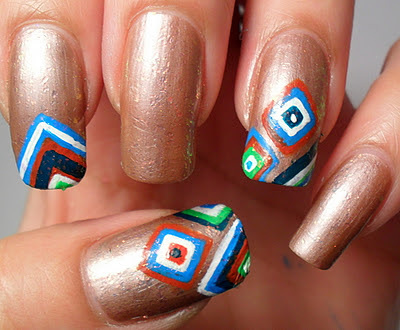 Now, before I'd even reached day one of the challenge, I had decided that I was not going to do Aztec print. Whilst I had seen some fantastic Aztec-icures (new word alert), floating around on blogs, I thought I'd do something different. Pretty adventurous after a hard day at work right? Now THIS was slightly more achievable! 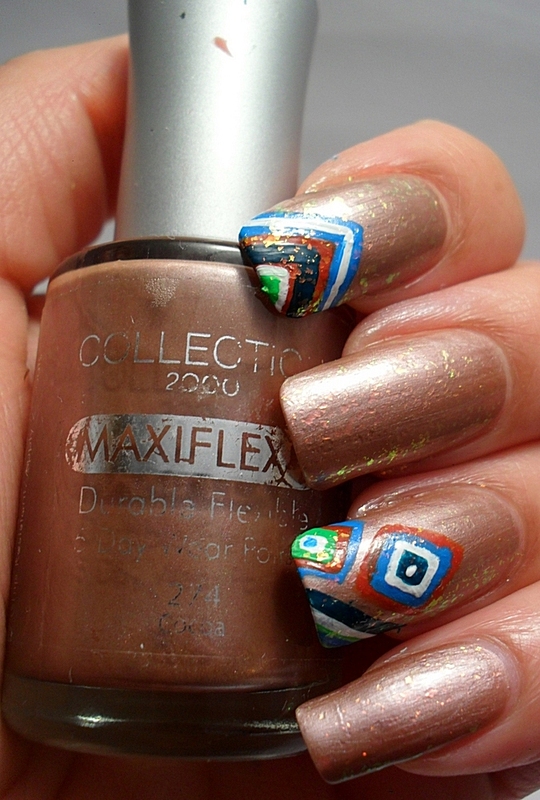 Collection 2000 'Cocoa' - this is a dusty (old/discontinued polish) and I have had this forever. 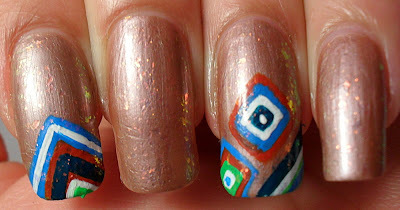 I slathered it in a coat of Nubar 2010 and then did the squares with my trusty acrylic paints. Don't mind the blue palms. Phew, glad I got that one out of the way because it was hard just trying to think of what to do! Delaynee, to name a few ladies, is doing the challenge. Right, I'm off. I have a date with my Helmer. 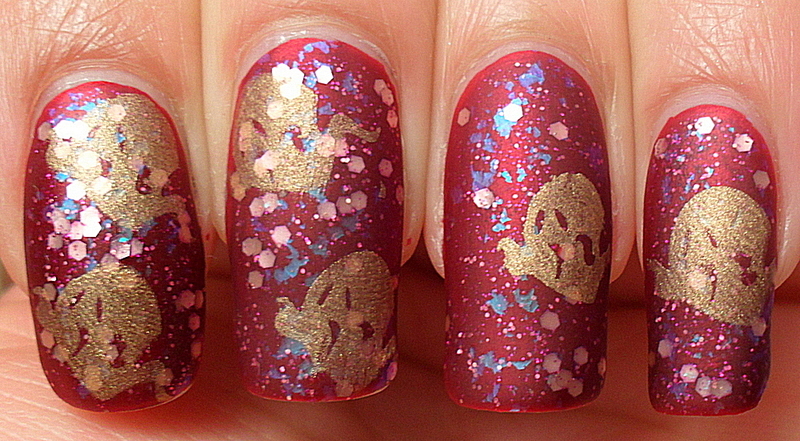 I'm sat here in my pj's about to post today's delicate print nails. Such a nice blue pearl. Only two pictures tonight I'm afraid. 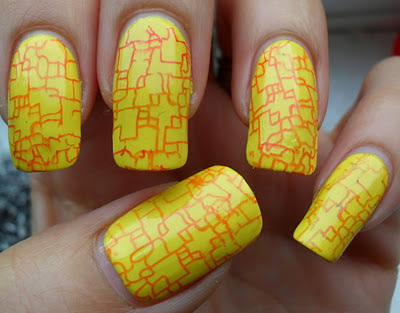 I couldn't capture the pattern, that's how delicate it is!